No matter how sticky, adhesive and viscous the material is, KENKI DRYER of International Patent can dry it without clogging inside of dryer and with stable operation that no operational trouble occurs because of its unique mechanism. Sludge after dehydration process of waste water treatment is often affected by flocculants and forms large lumps, and it frequently happen that only surface is dried but inside are not when sludge is discharged as large lumps. In the drying process of KENKI DRYER certificated as International Patent, the material to be dried are moved forward into the dryer’s main body smoothly by being heated and crashed with a feeder at inlet. The materials get smaller and smaller since they are continuously sheared and agitated during being conveyed and heated. As the material get small, heat reaches to inside more smoothly and surely, and quality of outputs becomes stable. Since KENKI DRYER has simple structure, initial cost is low and is estimated to be repaid with cost of industrial waste disposal for about 2 -3 years. 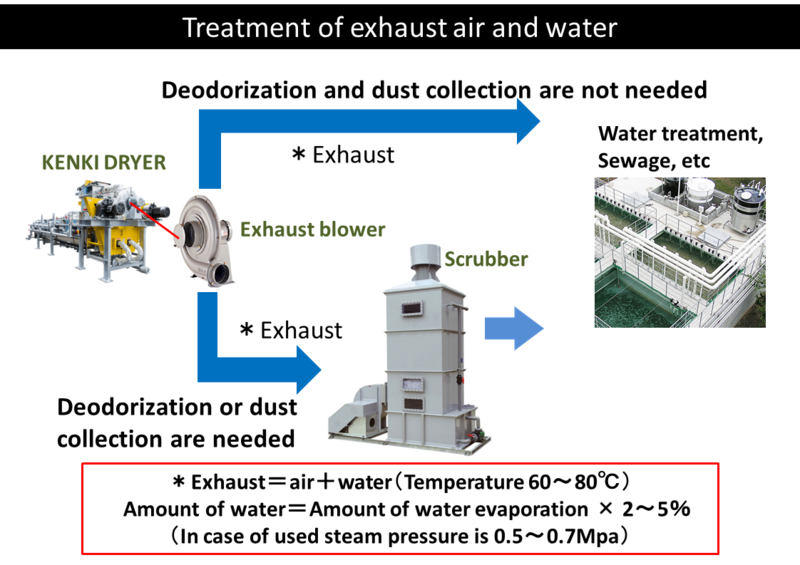 Also, even heat source of drying is only saturated steam, epochal mechanism based on combined use of conductive heat transfer method and heated air method helps to achieve high quality of safety and hygiene, and running cost can be kept low by using surplus steam within factory. Machine operation is easy and there is no need to assign operators because it is continuous operating system. Since number of replacement parts is small, maintenance is easy and maintenance cost is very low. Because of low-temperature drying, components of the material to be dried are hardly changed and organic sludge can be sold as fuel, fertilizer, etc. after being dried. Because the low-temperature drying does not use fire, temperature of the dryer’s outer surface is low and the dryer is safe and hygienic. Because fresh air from outside is cut off, temperature inside of the dryer is kept high, amount of moisture in the exhaust air discharging water is small, and the discharged water can be returned to wastewater treatment facilities.